Cross-platform LTI support is great. It makes it a lot easier to integrate with lots of LMSs at the same time. Getting LTI apps set up inside most LMSs is still a little tricky though. Below are some examples of configuring LTI integrations in major LMSs. Interested in building your own LTI app? There's a great module in the Canvas development course on LTI app development. LTI app configuration in Canvas can happen on the course or account. 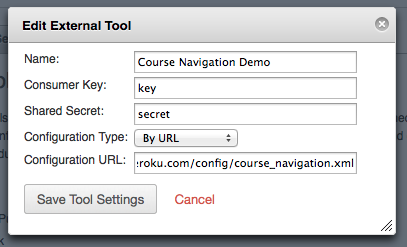 Click the "Settings" link in the left sidebar of the course or account where you want to add the app. Click the "External Tools" tab and click "Add External Tool". Enter the name, consumer key and shared secret for the app (for these demo apps you can put any key and secret that you like). For "configuration type" select "By URL" and paste in the full URL of the link configuration (copy the URL from one of the links below). After the app is saved you should see it appear as configured in the course our account content. Depending on the integration type, the app may appear different places, but most apps will appear under "External Tools" when adding items to a module. Blackboard added support for LTI apps in Learn 9.1 SP4. The following video and page explains LTI links and how they can be used in Blackboard Learn. Moodle added support for LTI apps in version 2.2. The following page explains how to set up external apps in Moodle. Desire2Learn added support for LTI apps in version 8.4. To get at their configuration docs you'll need to log in to the Desire2Learn community, then click Documentation => 10.1 => Learning Environment => LTI.